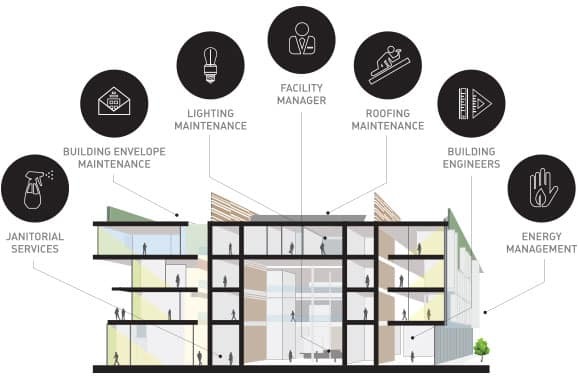 CXRE’s portfolio of LEED-compliant facility maintenance and management solutions offers clients the opportunity to select one, several, or all of our maintenance service packages. This provides clients the unique flexibility to utilize a sole-source vendor for all needs or to strategically place CXRE in phases throughout their vendor array. We provide our green janitorial services as a core service offering, because it provides us the benefit of being inside the facility on a daily basis to keep on top of LEED compliance. Many clients choose to begin the relationship with the core janitorial services, but soon choose to add on the compliance and cost control benefits of the other integrated services. We provide LEED-AP managed services from former executives in the traditional building maintenance and management industry. All are well-versed in LEED and understand how it is incorporated into the operations and maintenance of a green building.